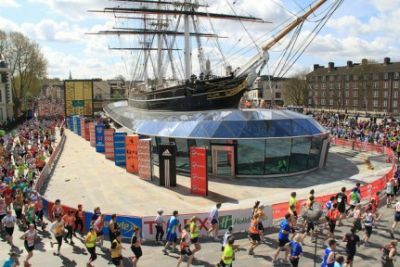 You may have seen on TV over the weekend the first man to sail around the world single handed, Sir Robin Knox Johnson, with the Olympic flame in his hand, run by the Cutty Sark resting in its final home at Greenwich. It was a symbolic gesture to the gods of sailing. Cutty Sark was completed in Dumbarton in 1869, the year that the Suez Canal opened, making her and her fellow clipper ships seemingly redundant overnight. Strange that exactly 100 years later QE2 went into service just as Concorde was making her maiden flight, the death knell of the transatlantic liner. Just like the QE2, Cutty Sark was something special not to be quickly consigned to a premature end. Today she sits close to the National Maritime Museum (which she is now part of) having survived a dramatic fire in 2007. In April of this year she was reopened by the Queen, together with the Duke of Edinburgh, who has been closely involved with the ship since she arrived in her purpose-built dry dock in 1954. If you hear an Airbus A380 Captain complaining of his sleeping cabin in the front module of the aircraft just tell him that he is lucky not to be the master of a tea clipper 150 years ago. In those days the skipper did have his own accommodation, but it was hardly private and consisted of a bunk and writing table. And tall sailors were turned away. There is another analogy with today’s aircraft. Cutty Sark is of composite construction, in this case iron and wood. The ship has an iron frame with timber infill, the hull clad with muntz metal, 60% copper and 40% zinc. She also looked right and has been the subject of many fine paintings, some with artistic licence. 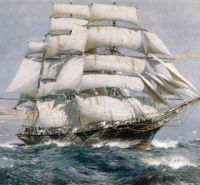 By the time Cutty Sark saw service on the China tea run the golden days of the clippers were virtually over. 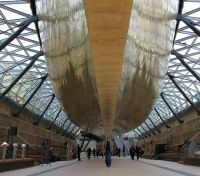 By modern standards the ships were not big, Cutty Sark herself 2,100 tons, 212ft long and 36ft beam. She carried 32,000sq ft of sail, equal to 3000hp. With a maximum speed of 17.5 knots she could be quick, but was at the mercy of the winds. She could carry up to 600,000kg of tea, enough to make two million cups. Or transport 5,000 bales of wool. The first delivery of the new season's crop was inevitably dubbed “the tea race” and in 1872 the greatest chase of the era took place, Cutty Sark v Thermopylae, the two ships leaving Shanghai within minutes of each other. By the time Cape Hope hove into view Cutty Sark was 400 miles ahead but during a storm the rudder broke. This was repaired at sea. She eventually made London after 124 days at sea, nine more than Thermopylae. Like all good losers she is remembered, not her rival. By the end of the 1870s sailing ships could no longer compete with their coal fired rivals to and from China. Cutty Sark embarked on a career bringing wool from Australia but by 1895 that had collapsed too. She holds the sailing record between London and Sydney of 77 days. It was in that year she joined the Portuguese merchant navy as Ferreira, although affectionately still called Cutty Sark by her crew. 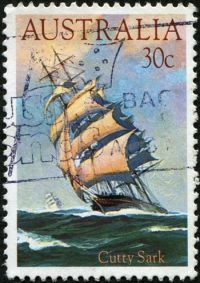 Over the next decades she visited most of the ports in the South Atlantic. A visit to Falmouth in 1922 was noted by Wilfred Dowman, a retired sea Captain, who knew her history. It just so happened that his wife was part of the wealthy Courtauld family of carpet fame. Dowman purchased the ship turning it into a sail training vessel for cadets, firstly at Falmouth and, after an eventful tow in 1938, to Greenhithe on the Thames. Today the Cutty Sark is a very modern visitors’ centre with ‘hands on’ experiences for children. You enter through a purpose-built door in the hull which takes you into the enormous cargo hold capable of holding up to 10,000 tea chests. There is an exhibition in this area, a short film showing the history of the ship, and the way up to another much smaller cargo deck with restricted height. The 15-man crew lived on the top deck in very basic accommodation towards the bow, with their own galley and workshops for the ship’s carpenter and sailmaker. They got very wet during inclement weather, and roasted in the tropics. The officers were better housed near the stern. Cutty Sark has been raised 11 feet into the air, relieving the keel of the weight of the ship. For the first time visitors can walk underneath the hull. The exhibition is all under cover although there is access to the main open deck. One exceptional part of the exhibition not to be missed is the figurehead collection located conspicuously ahead of the ship’s bow in the dry dock. Originally put together by Sydney Chambers, a successful businessman with a passion for marine artefacts, the 101 figureheads were donated to the nation in 1953, and joined the ship a year later when she arrived at Greenwich.